This is Sierra. A people loving, food stealing Lab/Golden Mix. 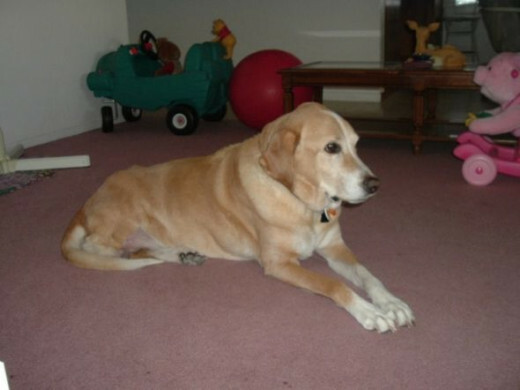 Sierra wasn't the best dog for the first three years, but she turned into one of the most gentle companions. You could trust her around children--not so much your lunch. She was great with kids and let them do just about anything to her. She tolerated it all for a tummy rub and a chance to steal the sandwich off their plate. Sierra developed cancer and became an amputee at 9 1/2. She endure the surgery and the four week recovery period with an inner strength and nonchalance most humans have trouble exhibiting. She taught us all what it was like to be a survivor. She showed everyone that a three legged dog is just as happy as a four legged dog. My brother gave Sierra to my Mom in October of 1996. 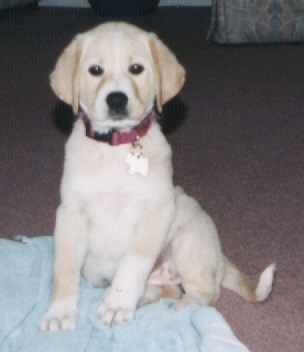 Sierra was a 9 week old Lab/Golden puppy. She latched on to me right from the start and we were inseparable for almost 14 years. Sierra and I went through so much together. She was a wild, aggressive puppy who needed constant training for the first three years. That role fell to me. 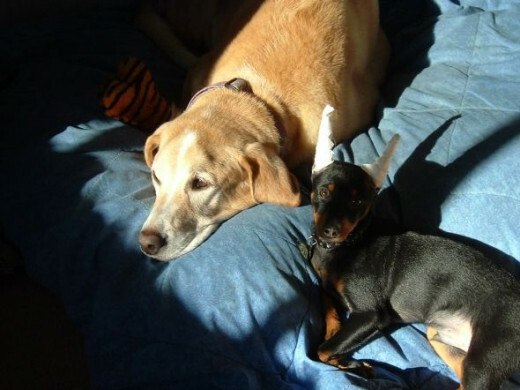 When I was diagnosed with severe arthritis, Sierra was a my constant companion. It was amazing how she knew to be gentle around me and how she knew when I needed some extra loving care. So, when Sierra was diagnosed with cancer in February of 2006, I knew that I had to do everything I could to see her through it. My Veterinarian said something before Sierra's surgery that I learned was very true! Dogs don't pity themselves when injured. Unlike humans, they won't wallow in their misery for months. They pick themselves up and figure out how to survive. I saw this in my dog. Her will to learn to walk with one less leg was inspirational. 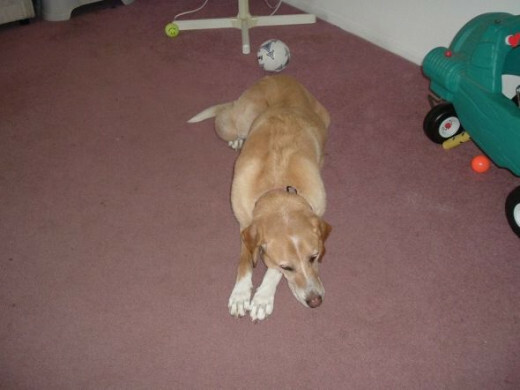 In early 2005, I noticed a lump on her back right leg. I had the Vet check it out. She aspirated it and determined it was fatty tissue. Because Sierra was 8 1/2, we decided to leave the lump alone and keep an eye on it. It didn't bother Sierra at all. In fact, sometimes you'd find her resting her head on it as if that was the purpose of this thing growing on her leg. In December of that same year, the lump was getting larger. I didn't really think much about it since the doctor had already checked it out. But I should have. Two months later, it ruptured. That's when I learned Sierra had cancer. Our treatment options were pretty limited. A specialist quoted $15,000 to have the lump removed. 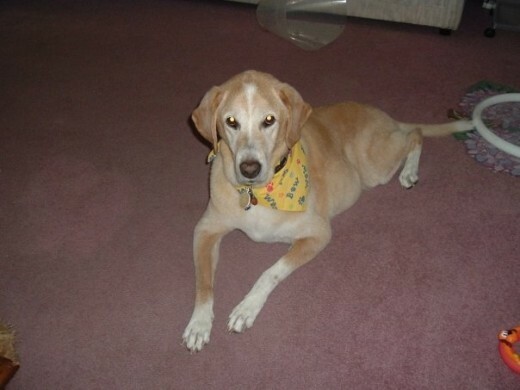 Then Sierra would have to go through chemotherapy. All in all, the treatment would be close to $25,000. Even if I could have afforded that amount, I couldn't put Sierra through it at her age. The other options were to have her leg amputation (which didn't seem right) or let her live out what life she had left. I had been lead to believe we had several weeks if not months to make a decision. But two weeks after the lump ruptured, her regular Vet informed me that I had to make a choice quickly. She was losing too much blood and would die soon. I restled with the decision. Sierra was still very much full of life. Still begging for food despite the fact that her leg was wrapped in bandages. But a couple of days later when Sierra woke up and didn't want to eat, I knew I had to make a choice. My Dad and I drove to the Vets early that morning knowing Sierra might not come home. Two days later Sierra was home, high on drugs, and missing a leg. The third day after surgery she got up to watch my Dad eat dinner. The fourth day she stood on her own and ate dinner. It looked like we were going to get through this after all. 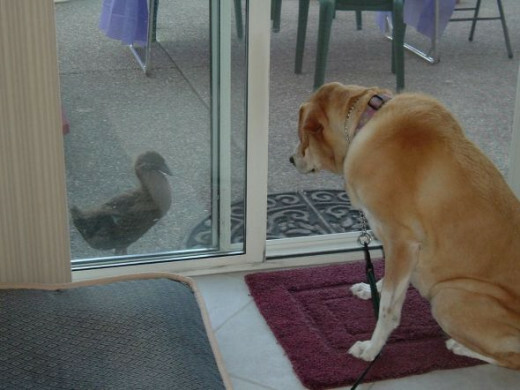 Be Inspired by Other Disabled Pets! There are many more disabled pets living wonderful, happy lives. There stories warm our souls and teach us humans to not be so hard on life and to live in the moment. Sierra's story touched people in ways I could not imagine. There are many dogs like her. Read their stories in "Almost Perfect." Each has a disability but they aren't letting that get in the way of living. We could learn a lot from animals. Where they assess their disability and figure out how to move on, we tend to wallow in self pity. It's understandable. It's life changing and there is a grieving process. But, if we were a little more like dogs we might be able to see the hope that they seem to life in every day. How was Sierra's Life Changed? 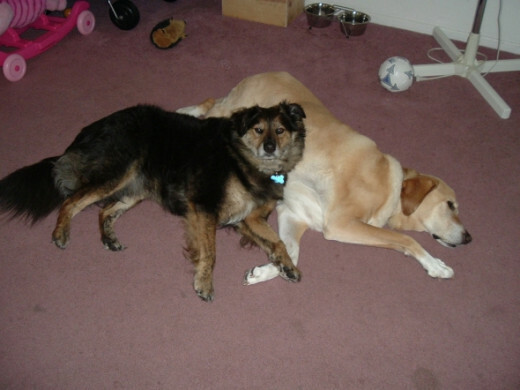 By the time Sierra was 8, she was a pretty lazy dog. 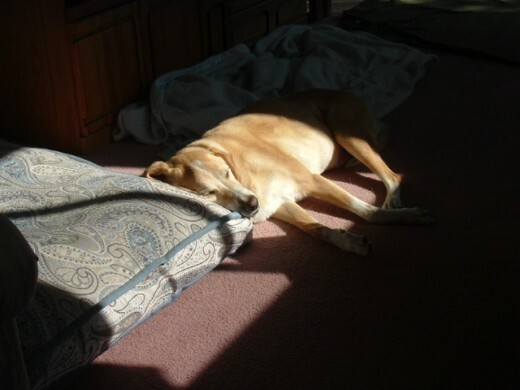 Her favorite things to do were eat, lay in her sunspot, visit with her friends, take her daily walks, and eat. After amputation, her life didn't change much. There was a four week transition period where the muscle strength in her other legs had to be built up. It was more difficult for me to keep her confined in her safe area than anything. Pain or not, she was ready to roll five days after surgery. After that first month, we were back to our regular routine. We started doing our daily walks and I made sure she got a lot of time outside. It was interesting to see how people reacted to Sierra's disability. At first, no one wanted to look at her. I have to admit that the surgery area was not very pretty. Sierra seemed to understand that people had trouble looking at where her leg once was. She'd flip over on her back and kick out the other leg asking for a tummy rub. This made people laugh because it was so awkward looking. I was fascinated by how people were drawn to Sierra after her amputation. Strangers passing us on the street felt the need to come over and hug her. They'd want to know what happened to their leg. Then they'd share a story about a dog they lost. Children were especially intrigued and sometimes a bit disturbed. I tried to explain things in terms that they understood so as not to frighten them. Sierra loved people and lapped up all the attention she got for being an amputee. In this way, I saw her as an ambassador for disabled pets. 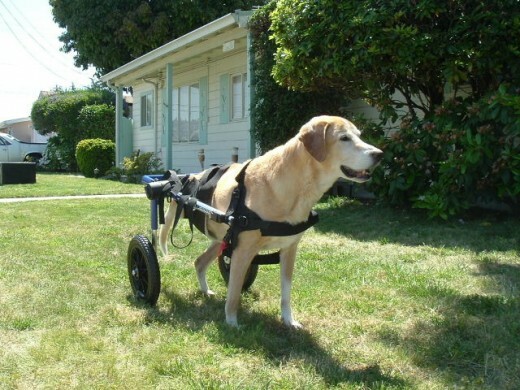 Sierra showed that a dog with three legs can still enjoy life. People got used to seeing her around. The sight of a three legged dog was no longer an oddity. Don't think that a dog needs four legs for a good life. Dogs are incredibly resilient. Unlike humans they don't whine over their lost limb. Was the Amputation Worth It? The amputation prolonged her life three and a half years. Three of those years she enjoyed to their fullest. She only struggled those last three months. I had worried that the amputation would only make her more miserable. In reality, the only ones bothered by her missing leg was the humans around her. I know now that the amputation was a gift. Not only did it buy Sierra more time, but it inspired me to keep moving. We both had disabilities. When I saw the eagerness that she greeted each day, I knew that I had to get moving. If she could do it, so could I! Six months after surgery she had a set back. She developed arthritis in her the back hip on her left side. The emergency room Veterinarian told me that Sierra would have to be confined to the yard and that I shouldn't expect much out of her. Our regular Vet had a different plan. She got Sierra started on an anti-inflammatory and then I added a supplement (Glycoflex). I had to keep her moving and so I did. Sierra was all too eager to continue taking walks and playing in the yard. She was angry at me on her bad days when I kept her inside. But the regimen worked. For the next three years, Sierra had a very happy life. 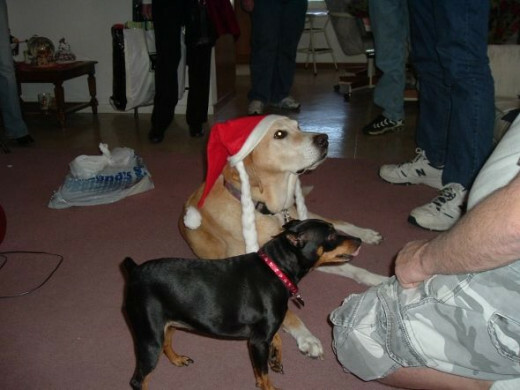 Despite being an arthritic amputee, she got to enjoy all her favorite things. She got daily massages from our elderly neighbor. She was back to stealing food from the dinner table. She couldn't wait for our monthly family birthday parties. She demanded to be taken along! Despite the amputation and arthritis, I was able to keep Sierra active and to keep her healthy. The Vet at Sierra's continued good health considering her age and her size. 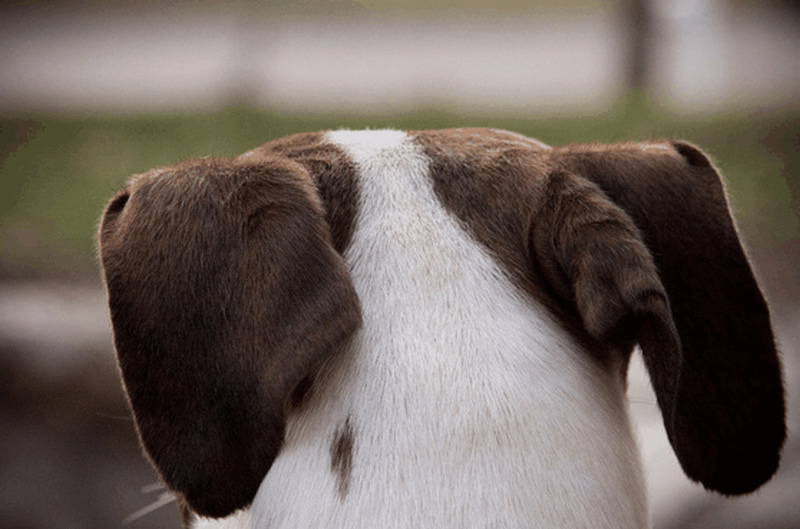 Have you ever had a disabled pet? When dealing with an amputee, there are a couple of things that might make life easier for both of you. While moving around the house might be easy, jumping in and out of the car may be difficult. A car ramp that is adjustable can be kept in the trunk of the car and pulled out when needed. For bad days when you need to help your dog move around, use a large towel for lifting. Position the towel near the front paws on the belly. Use the ends as a handle. There are wraps with handles sewn into them for this purpose as well. A small wooden ramp can make access in and our the house easier. 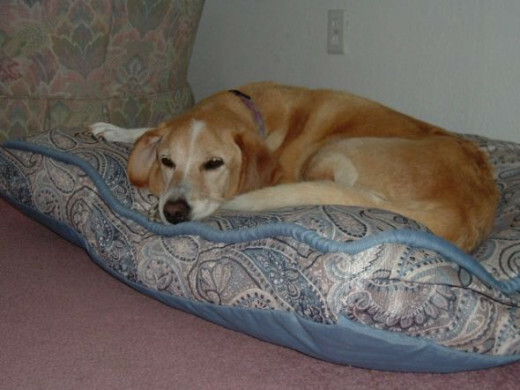 Get a comfortable bed for your dog. If you have blankets on the bed, be sure that your dog's legs don't get tangled in them. Make sure there are no ends for their paws to get caught in since their balance is different with three legs. A heating blanket can help with some of the aches and pains that they may experience. They make heat reflecting blankets that don't use electricity. At 13 1/2, it seemed the arthritis had finally caught up to Sierra. I made her life easier by blocking off in the living room. She had the entire room to move around in during the day and I didn't have to worry about her slipping on the linoleum. I placed throw rugs in the hallway and helped her walk to bed. I had a ramp out the back door to help her make it over the ledge of the sliding door. 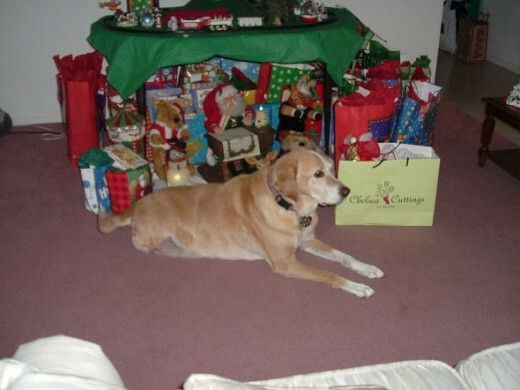 Thanks to the Handicapped Pets Foundation, Sierra was awarded a donated doggie wheelchair in May 2009. It took her a week or so to adapt to walking on wheels. But when she got the hang of it, it made all the difference in the world. She had been confined to the living room for over a month. With her wheelchair she could run in the front yard and chase away the cats. I could see her brighten up each time she got to go outside and get some fresh air. Her mood definitely improved with her new found independence. Sierra's spirit lives on through the donated wheelchair. After her death, it was donated to a dog named MJ who was hit by a car and then turned over to a shelter two weeks later. A group stepped in and adopted MJ, paying for the necessary surgeries so he would survive. The wheelchair has helped MJ regain mobility. Through hard work and therapy, MJ has regained the ability to walk. I think Sierra would have love to know her wheelchair helped another dog. 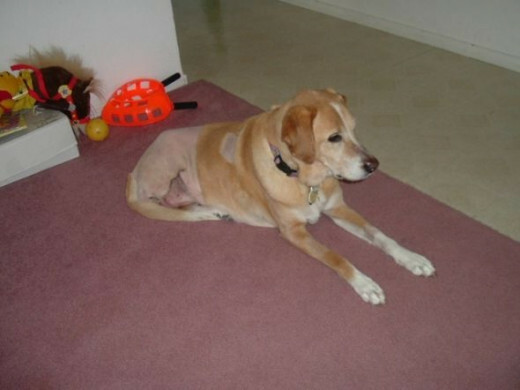 Sierra enjoyed a good life with little discomfort for more than three years after her amputation. In April of 2009, she made a small misstep stepping up on the porch. It seemed that this little mishap set off her arthritis. Her medications and supplements didn't seem to help. It was clear that her health was declining. I did my best to make things easy for her. The doggie wheelchair got her active again. She enjoyed going out front and being able to mosey around the yard. Her 20-30 minute sessions brightened her day. For a couple of weeks she was able to live life like a normal dog again. The day she died started quite normally. She got up eager to eat as always. We went for our jaunt outside. She stumbled coming in but I didn't take any notice of it since she got right up and wanted a treat. She was excited to see my nephew who stopped by for a visit. Around 2 that afternoon, she acted as if she wasn't feeling well. She didn't want her spoonful of yogurt which was unusual. When our neighbor came over at 3, she didn't want to get up off her bed. They were great friends and spent an hour each day together, so this concerned me. An hour later she was sick and within that hour she had passed away. She was a month shy of her 14th birthday. While it was shocking to lose her suddenly, I was happy that she went out on her own terms. A great organization that helps pet owners get wheel chairs for their disabled pets. This is the group that Sierra got her donated wheel chair from. 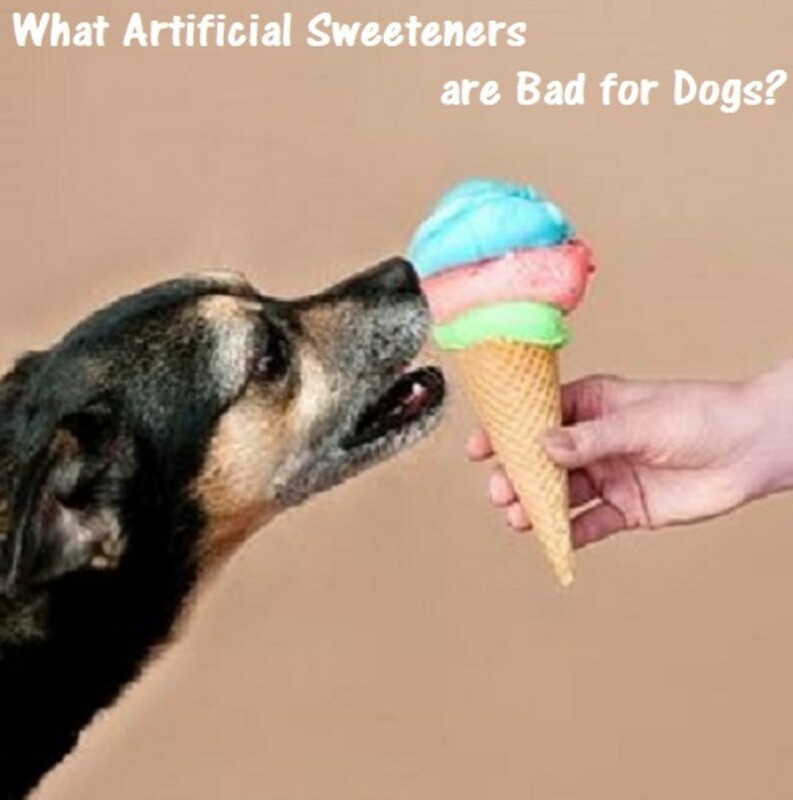 Are Artificial Sweeteners Bad For Dogs? Your story is very touching. Thank you for publishing it. What a special and loving bond that you and Sierra shared. I enjoyed so much reading her story of triumph over illness. @imaginemdd lm: My pleasure! Through my experience I learned that animals have a tremendous capacity to survive and to enjoy life no matter what is ailing them. I hope you kitten enjoys a wonderful, long life! Thanks for sharing Sierra's story. Spirit Sierra, thank you for showing the world what we can do. Run free sweet girl. 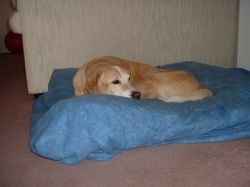 Sierra sounds like the most wonderful friend and companion, as well as a brave one. 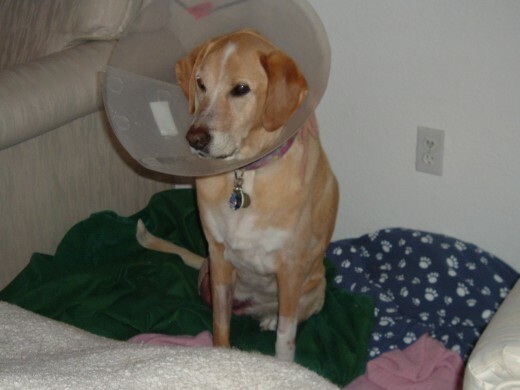 It's inspiring to read of how well she adapted to being an amputee and later to her doggie wheelchair. It's easy to see how happy she was. This is a beautiful tribute to a beautiful pet. Thank you all for your kind words. 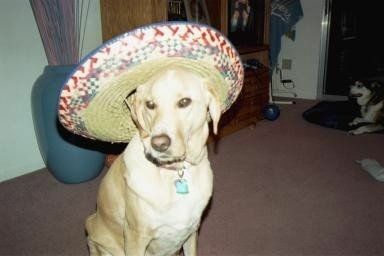 Sierra was a special dog. I remember being at the emergency vet clinic two nights before we decided to have her leg amputated. Her wound was bleeding and needed rebandaging. As we waited, she worked her way over to the next booth where a family was eating sandwiches. Here she was slowly dying, but she still hoped to get a bite of something to eat. It told me everything I needed to know about her spirit and desire to keep going. I made up my mind to do whatever I could for her that night. A really lovely story and I commend you for taking on a dog with a disability. Every year gained is precious.